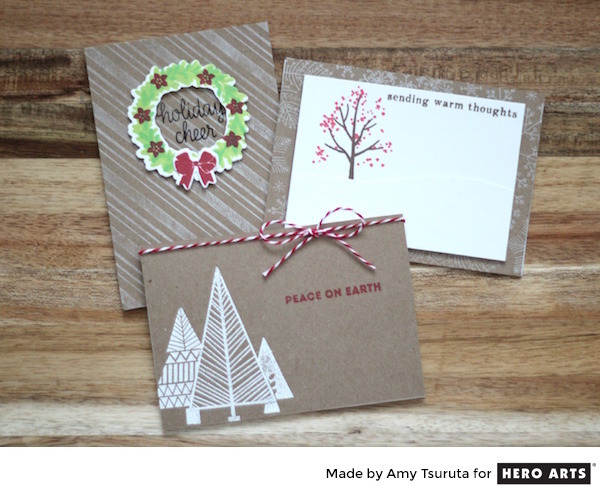 Tsuruta Designs: Hero Arts + A Blog Name Hero Holiday Blog Hop! 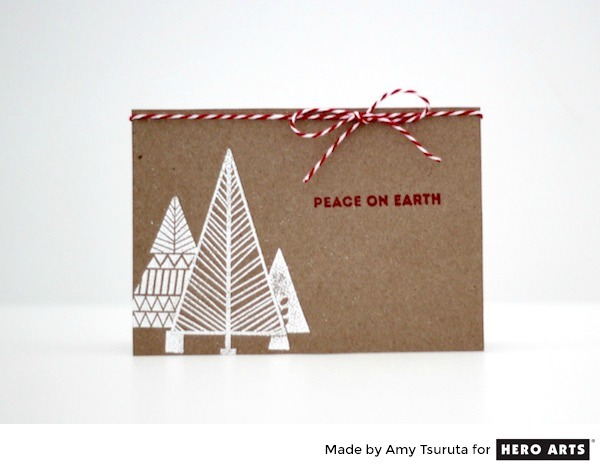 Hero Arts + A Blog Name Hero Holiday Blog Hop! Hello! So excited to be hopping with the Team over on A Blog Named Hero! You should have arrived here from my bloggie friend, Niki Garcia's blog! If you didn't, you'll want to start at the beginning of the fun which is the Hero Arts Blog! Comment to win: Hero Arts has stashed away a few of the November 2015 My Monthly Hero kits to giveaway to three lucky readers of this hop! The winners will be randomly chosen from all of the blog hop comments, across all blogs, received by 11:59pm PST on Sunday, November 22nd. Check the Hero Arts blog for the announcement of the winner on Tuesday, November 24th. To enter, just leave us a comment here and visit the rest of the blogs on the hop, too, leaving comment love as you go! Let's get started, shall we?! I stayed in the overall same color theme which each card starting with a kraft base. I was channeling my inner nordic self on my first design. Red, White + Kraft = Yes, Please! The Clearly Kelly, Kelly's Noel is a super fun set with 3 different & fun trees. They have been heat embossed in white with the sentiment stamped in Pale Tomato. I finished off the card with red/white twine. I wish you could see all of the details on this card. The background panel has been stamped with the Hand Drawn Snowflake Bold Prints in Unicorn White. The Color Layering Fall Trees aren't just for Fall themed cards! I used it in my design with Cup O' Joe and Pale Tomato mid-tone inks. Can you see the 'rolling hills' that have been stamped and sparkle embossed with the Hand Drawn Snowflake Bold Prints? Next up is a card that is clean in design...does it remind you of a front door? See the die cut bow? Underneath that is where I cut the wreath so I could complete the inner fussy cutting. Do you notice anything a smidge different about these cards? They are are all 3.5 x 5. I really enjoy working with this size. Remember to leave a comment! The winners will be randomly chosen from all of the blog hop comments, across all blogs, received by 11:59 pm PST on Sunday, November 22nd. Check the Hero Arts blog for the announcement of the winners on Tuesday, November 24th. Next up is the Super Jessica Frost-Ballas! In case you get lost, here's the hop listing! Seriously WOW!!! These are all GORGEOUS!!!!!!!!!!! Wow...love all three cards...each one is so beautiful! LOVE the white and red on the Kraft, LOVE your ELEGANT designs, especially the trees!!! Fabulous holiday cards! Love those trees! Such a fabulous trio of cards - love!! Amy, Love your trio set of Kraft! So elegant and graceful! Love the Kraft paper and heat embossing. Yes, the last card does remind me of a front door! This is such a pretty card trio! Love the kraft and white! Such lovely cards, Amy. I do like the kraftlook in combination with white. Lovely holiday cards, Amy, always love kraft with red and white! Happy Monday! Kraft and white combo rocks here!!! Love it! Wonderful holiday cards!! I just LOVE the kraft papers!! Gorgeous stamps!! These are SO beautiful, Amy! Love the stripes and trees and everything about these! White stamping on kraft is one of my absolute favorite looks! Wow! Love all of your cards Amy! So lovely with the Kraft red and white! Oh, fantastic kraft designs with the white & red! will case these for sure! Charming set of Nordic style cards Amy!! Love, love, love the white on Kraft! All three cards are beautifully done Amy! Amy, three of them are FANTASTIC cards! The white on kraft is just beautiful! Love the kraft base - 3 pretty designs! Wow! These are great. I love Kraft paper. Fun cards, Amy. Love how you used the craft. Kraft cardstock and white ink are a match made in heaven! Very lovely cards! awesome Holiday cards Amy.. loving all that kraft..
Hi Amy! You must be the most cheerful card maker i know!!! I adore your work! It's been awhile since I visited, but I promise I'll be back more frequently!! You had me at Kraft! Love these so much. Like the others, I also adore the kraft cards! I love the white sparkly snowflakes on white, very cool! Love the Kraft base it really makes the red an white sing. My favourite has to be the single tree with the rolling hills. White on Kraft has always been a favorite of mine. These are great. Wonderful cards!! Thanks for reminding me that kraft papers make awesome card bases!! I love white on Kraft, it just looks so clean. The red gave it just the right punch. And yes, your wreath does look like it's hanging on a door. I'm in love with kraft!! I'm finding myself using kraft more for the Christmas cards that I'm making. I LOVE kraft and white . . . thanks for the inspirations. Great cards. Love the wreath. Kraft and white are 2 of my favorite color combos. Great cards. Thanks for the inspiration! KRAFT CARD ONE OF MY FAVOURITES AT THE MOMENT. LIKE THE WHITE STANDING OUT ON IT WILL HAVE TO TRY THIS. THANKS FOR THE INSPIRATION. These are fabulous! Love that Pale Tomato color! LOVE LOVE LOVE white on kraft and Unicorn white by HA is my favorite! Beautiful cards! Like the kraft card with the white and red. Oh so pretty-love kraft, white, and red!!! Hi Amy ~ Your cards are simply fantastic!! I think white ink on kraft paper is stunning and your cards are the perfect examples. Such a clean look. I've tried several different white inks and recently bought the HA Unicorn White pad. LOVE it....thanks so much to Jennifer McGuire & others for recommending it. Your cards are simply awesome. Awesome job on all your cards. Great job! I love white on kraft... don't know why I don't use it more often!! I'm really impressed with the white on kraft. Loved all your cards!! How wonderful. I love the candy cane background stamp. Pretty holiday cards! I like the look of kraft paper and white ink. Kraft card stock is my favorite. Thanks for sharing these cards. Love your use of Kraft paper! I love using Kraft paper for Christmas cards! I also already have the candy striped background stamp which was a must have as soon as I saw it. It looks great in white on the kraft background. Thanks for great ideas! Beautiful cards! I really like the Kraft background with the white and red! I love the last one that you made to look like a door with a wreath. Using th background stamp with the Unicorn ink on Kraft made a beautiful backdrop for the wreath! Thanks for all the inspiration. Wonderful CAS Christmas cards! I love the white on kraft! The striped background looks fabulous! My favorite is the three trees, the white EP really pops! super cute batch of cards!! LOVE the adorable tree!!! I so admire CAS cards and am so unable to make them, seeing them makes me envious, because I am one of those gals that just has to have everything, and the kitchen sink on my works! Love how different yet beautiful all three cards are. And love the card size, it is very pleasing to the eye. My favorite is the three trees!! Very nice! I love the simplicity and your use of kraft color cards. I think the contrast with the white is super. Very nice. 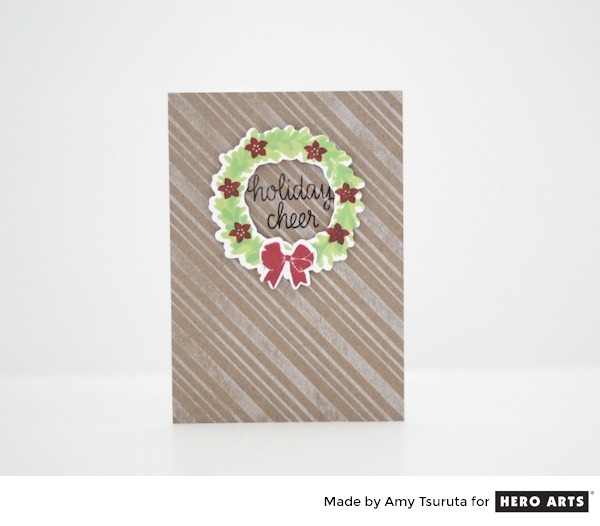 Love the look of the kraft background for Christmas cards, thanks for sharing! Awesome cards! My fave is the "cherry blossom" tree--so pretty! Your cards are beautiful. I really like the kraft cardstock you used especially with the white inked trees, very stunning. White on kraft is such a pretty color combo! The addition of the pale tomato is fabulous. The first card is my favorite. Lovely cards. The trees are my favourite. Gotta love a bit of white and kraft. Love all the cards here, kraft really makes a good color choice for holiday cards, love the second one very much with all the white stamping in the background. I like your trio of cards using kraft and white. Simple and festive...thanks for the ideas. I love craft cards. So pretty. love that card size too and the white embossing against the kraft background. White on craft is where it's at. Going to order some more craft today! LOVE the kraft card base - so often I just reach for white - I need to broaden my base of colors! I just love the simplicity of the trees card! I really love the Nordic look trees. Very impact-full. Thanks. I don' know why but kraft always make the images just pop off the page. Great cards! Thanks for sharing. White on kraft is always a good look - great cards!! Thanks for sharing! I love the simplicity of the kraft base, allowing the stamped images to dominate. Great Cards. I love the Kraft! It's my favorite cardstock. Beautiful cards! Thanks for sharing. Your cards are simple and clean but super cute. So krafty (ha ha ha). And yes, it absolutely looks like a door. Was that your inspiration? Love your fun card trio! I always love wreaths: lovely card! And the snowflake background is still on my wishlist! Great mix of cards! Love the white on kraft paper! Okay, now I feel like I'm getting in a kraft mood again. ;) These are all lovely, Amy!!! Can't go wrong with CAS! Very pretty. Three great cards to add to your stash! Amazing designs as always!! Three wonderful cards. My favorite is the trees card! Gorgeous cards! I love the clean look and white and red colors against the kraft background. Wonderful collection of cards Amy! Amy, well someone was in the crafty mood, lol. I love the look of the background stamps. Red, white and Kraft paper, you can't go wrong. Great job, thanks for sharing and sparking some inspiration. I just love the way you used kraft cs. My favorites are the Peace one and the wreath on the "door" [and yes, it does resemble a door]. Love the white on Kraft. It seems warm and homey. Great cards. I really like the white stamped backgrounds on the kraft. Super ideas! Thanks so much! Love the craft paper card. Makes a wonderful background. Love the brown. Thanks for the ideas and inspiration. Beautiful trio of cards! 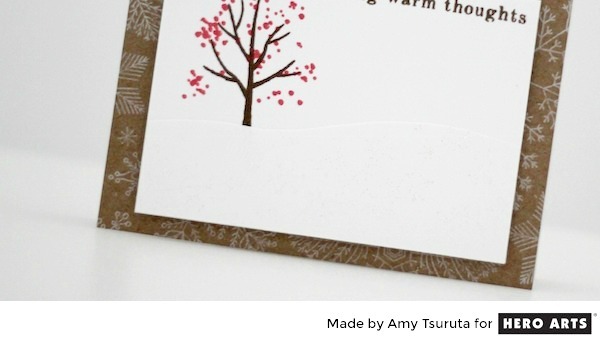 There's something about Kraft card stock that goes perfectly with holiday cards! I love white on kraft! These are gorgeous! Lovely cards using kraft card stock. I always love this look! So beautiful!!!! Love the kraft with the white stripes!! These are fabulous Inlove the Kraft base on these ! Great cards and I love the use of kraft cardstock. My favorite is the christmas trees. Thanks for sharing. What a gorgeous gift these would make as a set. I love how you used the kraft card stock. The simpliicity of your cards make them beautiful. Yay for white on kraft! Wonderful set of cards. Also love the stamped background behind the white panel. Love the stamping on kraft cardstock! Cyber Monday + other sales! Reverse Confetti's: Crazy For Christmas! Reverse Confetti: November New Release Blog Hop! Neat and Tangled November Release!